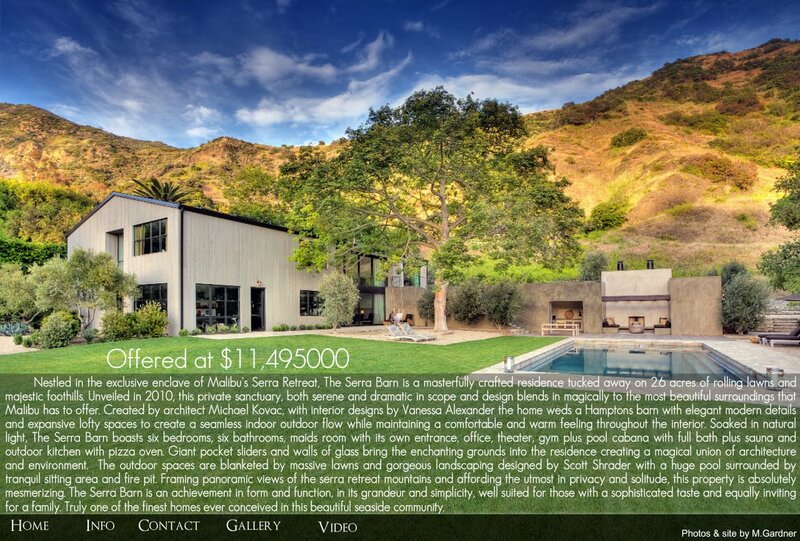 Nestled in the exclusive enclave of Malibu's Serra Retreat, The Serra Barn is a masterfully crafted residence tucked away on 2.6 acres of rolling lawns and majestic foothills. Unveiled in 2010, this private sanctuary, both serene and dramatic in scope and design blends in magically to the most beautiful surroundings that Malibu has to offer. Created by architect Michael Kovac, with interior designs by Vanessa Alexander the home weds a Hamptons barn with elegant modern details and expansive lofty spaces to create a seamless indoor outdoor flow while maintaining a comfortable and warm feeling throughout the interior. Soaked in natural light, The Serra Barn boasts six bedrooms, six bathrooms, maids room with its own entrance, office, theater, gym plus pool cabana with full bath plus sauna and outdoor kitchen with pizza oven. Giant pocket sliders and walls of glass bring the enchanting grounds into the residence creating a magical union of architecture and environment. The outdoor spaces are blanketed by massive lawns and gorgeous landscaping designed by Scott Shrader with a huge pool surrounded by tranquil sitting area and fire pit. Framing panoramic views of the serra retreat mountains and affording the utmost in privacy and solitude, this property is absolutely mesmerizing. The Serra Barn is an achievement in form and function, in its grandeur and simplicity, well suited for those with a sophisticated taste and equally inviting for a family. Truly one of the finest homes ever conceived in this beautiful seaside community.